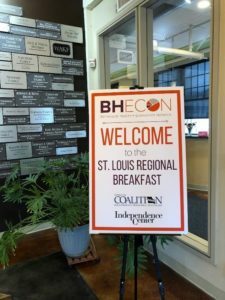 On June 22, 2018 the Missouri Coalition for Community Behavioral Healthcare, in partnership with the Behavioral Health + Economics Network (BHECON) and the Independence Center, hosted a regional breakfast to bring providers, individuals with behavioral health needs, state legislators and Congressional staff together to discuss challenges and opportunities for the state’s behavioral health delivery system. Certified Community Behavioral Health Clinics (CCBHCs) are actively addressing the behavioral health workforce shortage and increasing access to care. Compass Health, a CCBHC, has added 56 direct care providers in just over a year and has plans to add 51 more next year. The new hires include eight psychiatrists, which are traditionally one of the most difficult roles to fill. Compass anticipates next year they will be able to serve over 1,000 additional individuals with behavioral health and addiction treatment. Places for People, another CCBHC in St. Louis, has expanded their child and adolescent services, allowing earlier intervention among children with trauma, a population significantly correlated with higher rates of mental health and substance use disorders. “Early Intervention allows us to be smarter about what we do. It is smart to make the investment up-front instead of in jails or emergency rooms. We pay for it [treatment] one way or another, either upfront or later on at a higher price with less effective care,” shared Joe Yancey, CEO of Places for People. One #CCBHC in Missouri has been able to expand their service offering to children and adolescents, which now allows them to address trauma and toxic stress early on to prevent more severe symptoms later in life. Increased, early intervention at all ages means better MH outcomes. Mental Health Parity remains a challenge for Missouri and many other states. While federal law and regulations within the Affordable Care Act mandate parity of benefit coverage for mental health and substance use treatment with physical care, enforcement is sparse. Through the story of one attendee’s own experience, fighting for insurance parity on a case by case basis for mental health and substance use treatment requires resources that some individuals just do not have. Stricter enforcement and oversight is needed to ensure compliance with parity so that individuals with insurance coverage do not encounter barriers from their health plans to access needed mental health and addiction treatment. Relationships between behavioral health providers and law enforcement allow for better, faster, more effective care. Missouri’s Crisis Intervention Team (CIT) program coupled with the state’s Community Mental Health Liaisons (CMHLs) are creating stronger relationships between law enforcement and the behavioral health community. The results show that these programs are getting individuals in crisis into care versus jail. Partnerships developed by Missouri’s CIT program are giving greater access to behavioral health care at the appropriate time.